It's March and Ms. Mouse has been on a shopping spree! Why? Well as you know, MS Awareness week is this month - March 2 - 8. The week when all around the world, MSers and the people who love them, try to bring more awareness about MS by connecting with the people they know and come in contact with. Multiple Sclerosis Awareness Week is this month! I'm so excited. I've been waiting all year to buy something special and I found the most gorgeous dress to help bring about awareness to MS. I can hardly wait to show you! I usually only wear a bracelet or a ribbon, however, this year I went all out and bought the most beautiful dress in "ORANGE"! I know, I know! Perfect right? So what do you say? Why not connect with me by wearing orange this month? Let everyone know that "Orange is the new Black!" As always, I'm sending good thoughts and encouraging words your way. Look in the mirror and smile, knowing that I'm smiling right back at you. 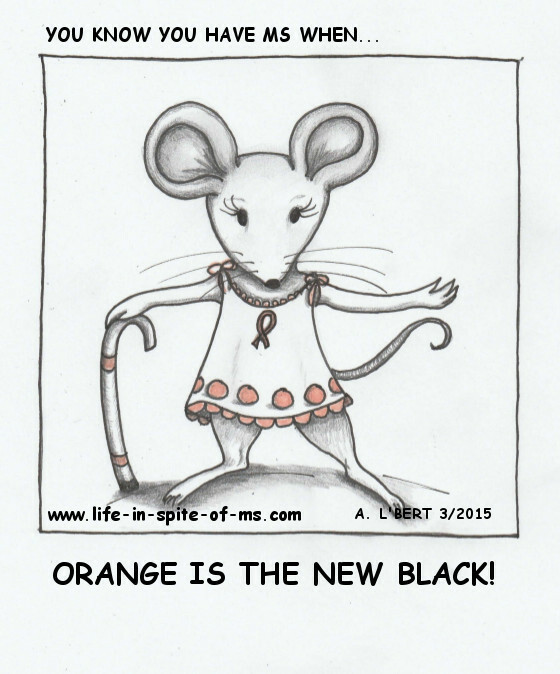 I hope you enjoyed the cartoon this month - MS Mouse 3 - 2015. Come back next month for another one of her fun and witty notes (as well as another cartoon), about how Ms. Mouse is dealing with multiple sclerosis. And if you like what you see, connect with her and leave a comment below. She loves reading them and will sometimes even respond back when she has something witty to say. Feel free to Pin, Share, and Tweet, this page to your MS family and friends. Go to the Cartoon Archives from MS Mouse.